Astronaut Buzz Aldrin July 1969, Apollo 11: spacecraft eyes (S/C/E) or is it zero gravity trauma? Perform a manned lunar landing and return. See how our brains work? We start making all kinds of assumptions that most of us know very little about but hey we’ll still punch out a fast answer. So what is the critical aspect of getting a concussion? Is it velocity- is it acceleration is it the brain mass moving around inside of our heads like taping a bowl of jello, so what is it that differentiates a concussion? Maybe we should think of how Mr Aldrin’s brain is constructed, starting at the embryo. The brain starts off as a speck, a grain of sand at the scale to the human eye. That tiny beginning grows according to the rules of Nature, which at this perspective will grow with the need of gravity to create the gorgeous shape of a new born baby. The rule of assembly for all those cells grows in the architecture of life is a balance of tensegrity, a web shape balancing tension to compression, a web of tensional integrity, hence tensegrity. Remember from previous essays, the tension integrity of cells connected to other cells all communicating all collaborating? 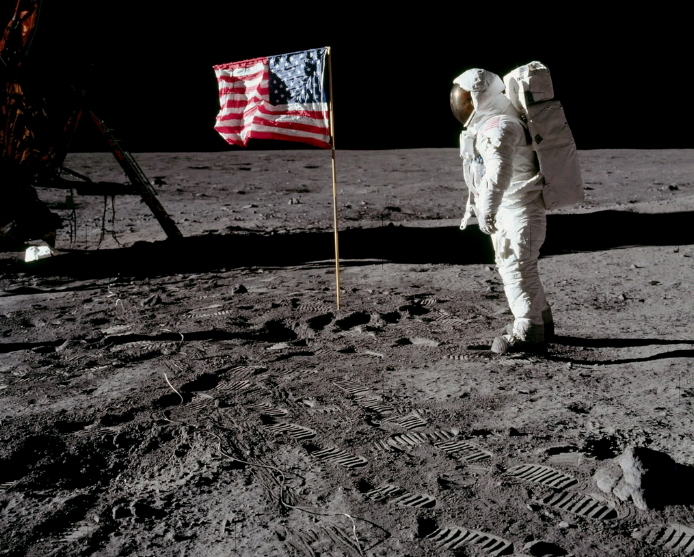 So I think it’s appropriate as you look closely to this moon astronaut in front of the American flag to see an almost hidden, beaming face staring at the camera. But Aldrin is a tensegrity man, we are all tensegrity men and women. We are all assembled from the tensegrity construction rules of the universe. We are all created as children of the universe. The maneuver to transfer the S-IVB from earth parking orbit to a trans-lunar trajectory must be performed over a point called the moon’s antipode. This is a point on the earth’s surface where an /imaginary line, drawn from the moon’s position through the center of the earth, will intersect the far side of the earth. In other words, it is the point on the earth that is exactly opposite the moon. Since the moon revolves around the earth and the earth is spinning on its axls, the antipode is constantly moving. This presents the problem of having the S-IVB/spacecraft rendezvous with a moving target, the antipode, before it can perform the translunar burn. Additional constraints on the execution of this maneuver are it will be performed over the Pacific Ocean, (2) it can occur no earlier than revolution 3 because of S-IVB systems life time. These constraints, combined with a single fixed launch azimuth, allow only a very short period of time each day that launch can be performed. To increase the amount of time available each day, and still maintain the capability to rendezvous with the antipode, a variable launch azimuth technique will be used. The launch azimuth increases approximately 8° per hour during the launch window, and the variation is limited by range safety considerations to between 72° and 106° . This extends the time when rendezvous with the projected antipode can be accomplished up to a maximum of approximately 4.5 hours. The minimum daily launch window for Apollo 11 is approximately 2.5 hours. degrees from the earth’s equator) will occur approximately 11.5 minutes ground elapsed time (GET) after liftoff. The vehicle combination placed in earth orbit consists of the S-IVB stage, the Instrument Unit (IU), the Lunar Module (LM), the Spacecraft-kM Adapter (SLA), and the Command/Service Module (CSM). While in EPO, the S-IVB and spacecraft will be readied for the second burn of the S-IVB to achieve the translunar injection insertion. As I have reported in earlier essays, the evolution of life proceeded with the transition of single bacteria learning to cooperate into groups assembled together. But already in place in terms of design evolution we have to look at the shapes of RNA and DNA. Shapes of proteins capable of replicating themselves, the shape based self assembly following the rules of assembly to make themselves into eventually coherent life forms. Please read if you can Evolution’s Witness for a very eloquent explanation of how eyes evolved essentially developing a brain to occur to interpret the vision authored by University of California/Davis Professor of Ophthalmology, Ivan R. Schwab. Back to some basics, if you have to pack the CanadaArm or unfold a solar panel destined for the orbiting Space Station how do you pack it so that the panel deploys the way it should in microgravity? The solar panel is assembled on Earth but the architecture of design to maintain the simplest shape is the shape that supports the tensegrity rules within Nature mimicked onto the exotic materials of the parts of a Space Station. The glaring difference is that those shapes are rigid. So what is the point of my essay, what am I trying to emphasize? Our body is like a miniature space station assembled laboriously but guided into its final position that determines the shape of both local dimensions with the global dimension. Like a space station there are all varieties of systems that interact and interconnect within the complexity of the entire shape of the structure. But every single cell interconnects into a global sensing network based on an architectural shape assembly following tensegrity construction guidance, scaled at the nano all the way up to the millimeter scale that we can perceive. If I were an executive of Google, I might query with: where does the operating system of building a human come from? Where do operating systems come from in Nature ? Is trans-location of RNA from a DNA segment a common language of shape assembly that is literally out there in the universe? We know lots of collisions happened against our Earth back during prime planet formation, yet some observers speculation is that millions and millions of ice comets brought their water onto Earth’s surface. If things were so hot and molten at one point any water would have evaporated, disappearing forever. Yet water is everywhere, great, vast oceans of it. Did it come from melting comets smashing into Earth’s crust? Is the blueprint operating system for life based tensegrity part of a larger operating system from the surrounding universe? conditions on crew visual perception. But what is this tensegrity stuff doing in a gravity field, it’s hard to extract the operating system if gravity has always been at least here present on Earth. Let’s reflect some more with one of my favorite tensegrity scientists, Dr. Donald Ingber from Harvard. Basically things have always been oriented on Earth there is an up and a down, a permanent vector pointing in the same direction for over five hundred million years impinging itself onto ever single life form since evolution started on Earth. First let’s get back to Astronaut Buzz Aldrin. As part of the moon bound trio, including Michael Collins, and Commander Neil Armstrong each space suited man lay in their Apollo capsule seats anticipating their historic liftoff toward landing the Eagle onto the lunar surface. Acceleration erupted into their bodies as the massive rocket burst from the launch pad. Vicious body crushing acceleration was needed to lift these astronauts away from the gravity pull that is so much a apart of all life on our planet. Slammed into their seat contours, their helmeted faces sucked, swirled and sagged as the battle to accelerate away from gravity happened in their arcing flame spewed journey into Earth orbit. Staging more bursts of motion and acceleration until the balance of orbit velocity was reached. Do these massive forces affect the eyes during orbital insertion? Zero G as it is called is the continuous fall of both astronaut with the spacecraft orbiting around the Earth, now there is no longer the 500 million year stabilization of that gravity vector pointing down, now the eyes start to play tricks onto Aldrin’s vestibular system. 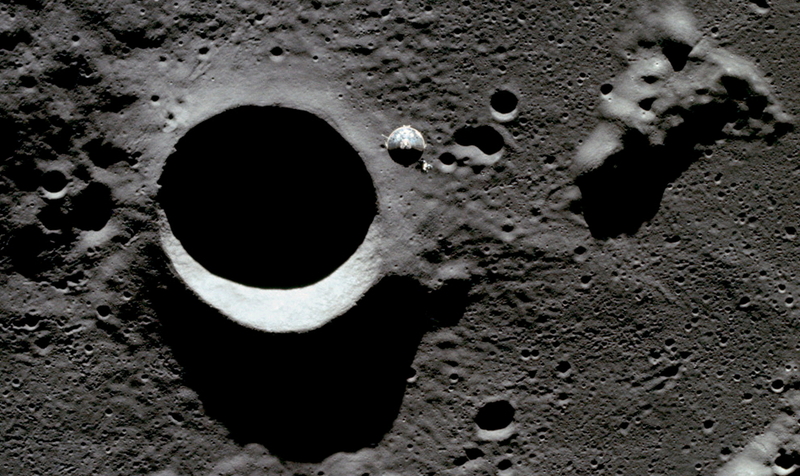 The tiny crystals within the bony semicircular canals no longer bend the tiny cilia lining these channels, now Aldrin became quite dizzy as his eyes looking about the Apollo 11 capsule no longer linking into his vestibular apparatus. 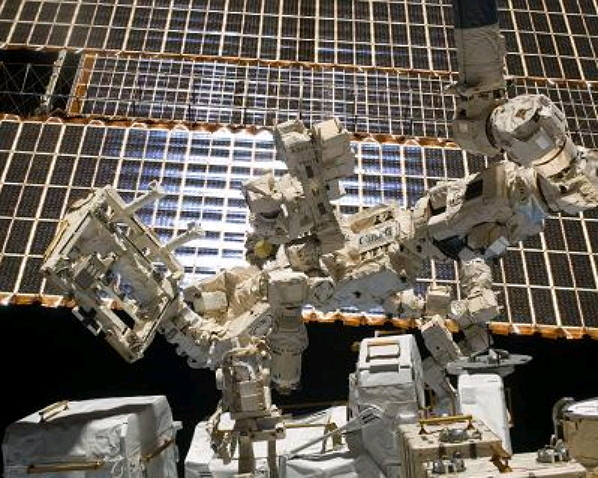 In astronaut lingo its spacecraft eyes (S/C/E) It’s debilitating as being vortex spinning drunk. Yet the flight schedule is jam packed with a very long list of items to accomplish before lunar orbit insertion will be attempted. Aldrin gets down to business despite the turmoil within his brain of where is head is. I will call this eye/vestibular brain response the zero g concussion happening within his visual system. His brain but more importantly his eyes were accelerated in the launch liftoff to jar his entire balance network into disequilibrium. Lots of tasks spun through Aldrin’s mind checklisting the flight tasks ahead of him. from the SLA/IU/S-IVB as shown in Figure 11. A pitchdown maneuver of a prescribed magnitude for this transposition_ docking1 and ejection (TD&E) phase is designed to place the sun over the shoulders of the crew, avoiding CSM shadow on the docking interface. The pitch maneuver also provides continuous tracking and communications during the inertial attitude hold-during TD&E. At approximately 1 hour 45 minutes after TLI_ a spacecraft evasive maneuver will be performed using the SPS to decrease the probability of S-IVB recontact, to avoid ice particles expected to be expelled by the S-IVB during LOX dump, and to provide an early SPS confidence burn. This SPS burn will be performed in a direction and of a duration and magnitude that will compensate for the TLI bias mentioned before. The evasive maneuver will place the docked spacecraft on a free return circumlunar trajectory. 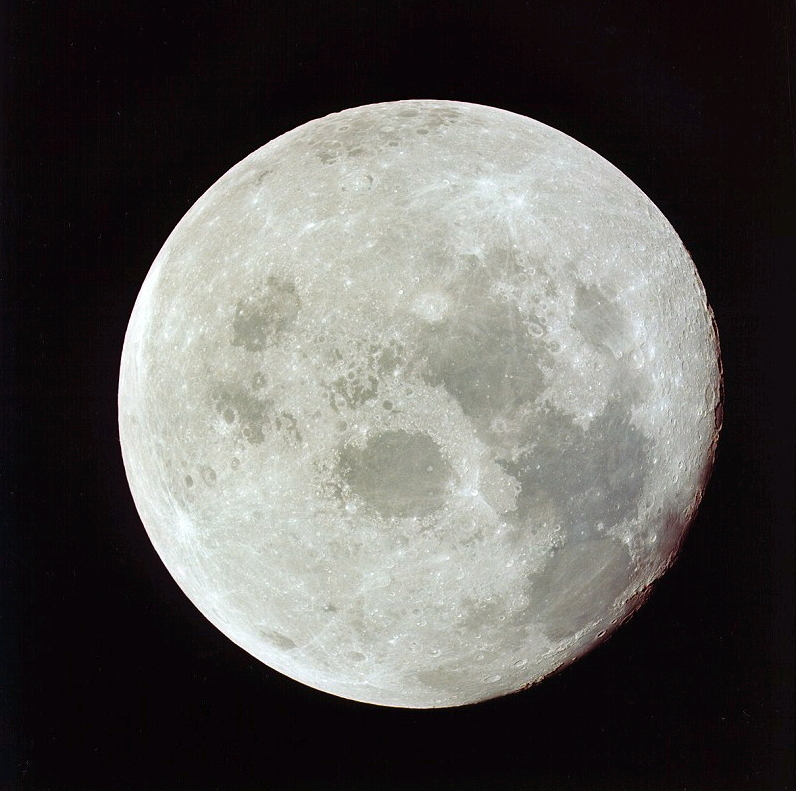 A free return to earth will be possible if the insertion into lunar parking orbit cannot be accomplished. plus 24 hours1 lunar orbit insertion (LOI) minus 22 hours_ and LOI minus 5 hours. These corrections will use the Manned Space Flight Network (MSFN) for navigation. The translunar coast phase will span approximately 73 hours. The S-IVB J-2 engine will be reignited during the second parking orbit (first opportunity) to inject the SV combination into a translunar trajectory. The second opportunity for TLI will occur on the third parking orbit. The TLI burn will be biased for a small overburn to compensate for the Service Propulsion System (SPS) evasive maneuver that will be performed after ejection of the LM/CSM from the S-IVB/IU/SLA. LOI will be performed in two separate maneuvers using the SPS of the CSM as shown in Figure 13. 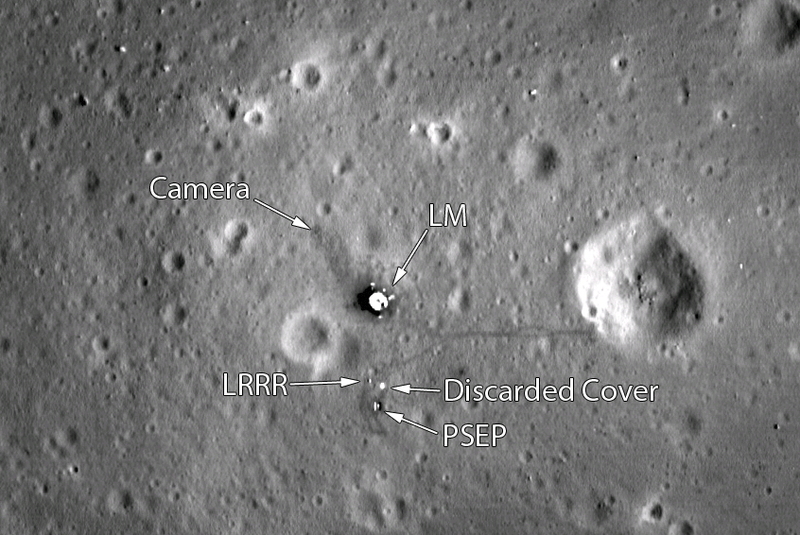 The first maneuver_ LOI-I_ will be initiated after the spacecraft has passed behind the moon and crosses the imaginary line through the centers of the earth and moon at approximately 80 NM above the lunar surface. The SPS burn is a retrograde maneuver that will place the spacecraft into an elliptical orbit that is approximately 60 x 170 NM. After two revolutions in the 60 x ]70-NM orbit and a navigation update, a second SPS retrograde burn (LOI-2) will be made as the spacecraft crosses the antipode behind the moon to place the spacecraft in an elliptical orbit approximately 55 x 65 NM. This orbit will become circularized at 60 NM by the time of LM rendezvous due to the effect of variations in the lunar gravitational potential on the spacecraft as it orbits the moon. After LOI-2, some housekeeping will be accomplished in both the CSM and the LM. Subsequently, a simultaneous rest and eat period of approximately 10 hours will be provided for the three astronauts prior to checkout of the LM. Then the Commander (CDR) and Lunar Module Pilot (LMP) will enter the LM, perform a thorough check ot: all systems, and undock from the CSM. During the 13th revolution after LOI-2 and approximately 2.5 hours before landing, the LM and CSM will undock in preparation for descent. The undocking is a physical unlatching of a spring-loaded mechanism that imparts a relative velocity of approximately 0.5 feet per second (fps) between the vehicles. Station-keeping is initiated at a distance of 40 feet, and the LM is rotated about its yaw axis for CM Pilot observation of the deployed landing gear. Approximately one-half hour after undocking, the SM Reaction Control System (RCS) will be used to perform a separation maneuver of approximately 2.5 fps directed radially downward toward the center of the moon. This maneuver increases the LM/CSM separation distance to approximately 2.2 NM at descent orbit insertion (DOI). 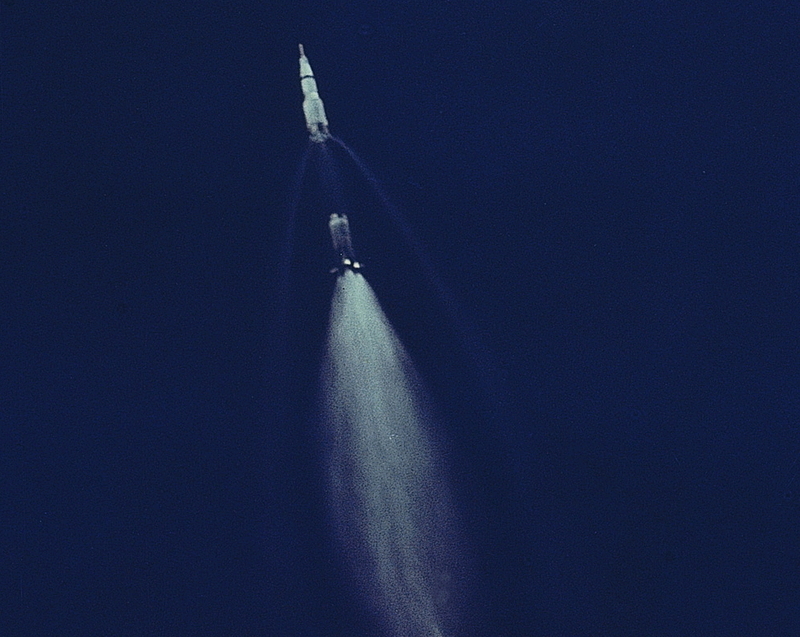 The DOI maneuver will be performed by a LM DPS retrograde burn, as shown in Figure 14, one-half revolution after LM/CSM separation. This maneuver places the LM in an elliptical orbit that is approximately 60 NM by 50,000 feet. 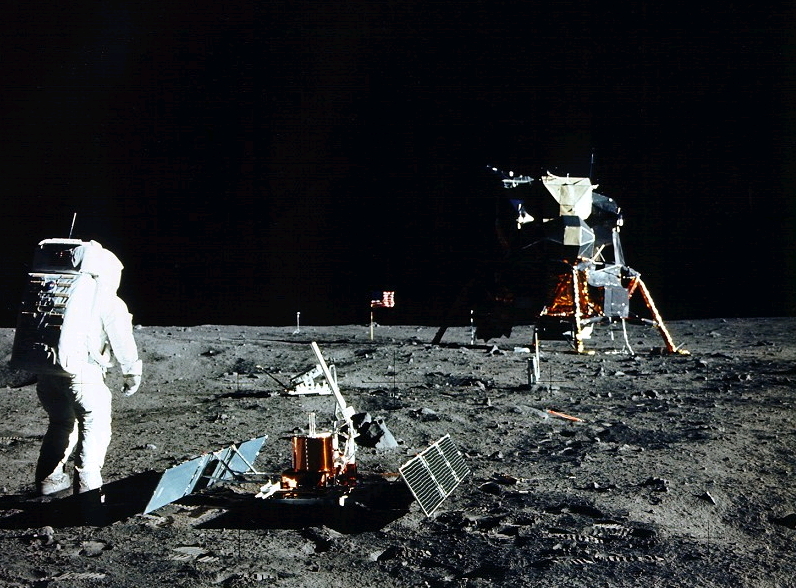 “Magnificent desolation” Buzz Aldrin reflected from the Moon after stepping off the Eagle landing module onto the lunar surface. With the recent death of astronaut Neil Armstrong a few days ago these thoughts of space disequilibrium happening on the moon are no longer a distant query. 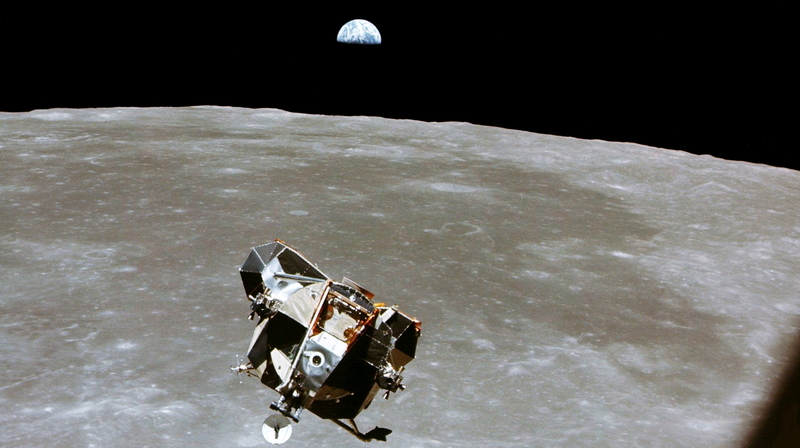 “Whenever I look at the moon it reminds me of the moment over four decades ago when I realized that even though we were farther away from earth than two humans had ever been, we were not alone,” it said. “Virtually the entire world took that memorable journey with us. I know I am joined by millions of others in mourning the passing of a true American hero and the best pilot I ever knew. 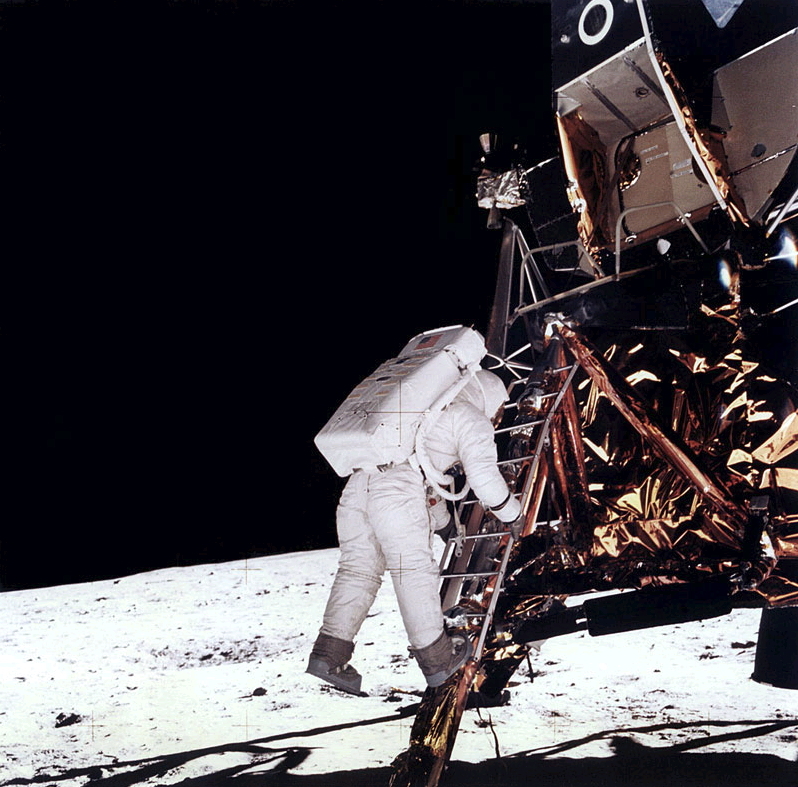 My friend Neil took the small step but giant leap that changed the world and will forever be remembered as a landmark moment in human history.” -Buzz Aldrin, second man on the moon. Another paper a decade later from Otolaryngology Head Neck Surgery 1998 Jul;119(1):65-77 Vestibular adaptation to space in Monkeys. by Dai M, Raphan T, Kozlovskaya I, Cohen B disclosed that, “These data indicate that eye velocity which tended to align with a gravitational axis before flight, moved toward a body axis after space flight of two weeks. This shift of orientation disappeared by 7 days after landing. An up down asymmetry of vertical nystagmus was (also) diminished for 7 days. These data indicate that there are short and long-term changes in otolith induced eye movements after adaptation to microgravity.” This is the adaptation that Buzz Aldrin may not have appreciated during his historic Apollo 11 flight back in 1969. But the gaining knowledge from the Neurolab program from the Cosmos series trying to understand the changes to the physiology of the human body to microgravity now that a robotic Mars lander has just landed recently on Martian surface leans toward astronauts walking on Mars. But the space research studies are revealing an incredible similarity of symptoms which overlap matching to post concussion. I introduce the turn of query to become: are spacecraft eyes induced as a zero gravity trauma? For the significant reason that vision represents 80% of the performance within the brain’s processing design. 1 Response to Astronaut Buzz Aldrin July 1969, Apollo 11: spacecraft eyes (S/C/E) or is it zero gravity trauma?